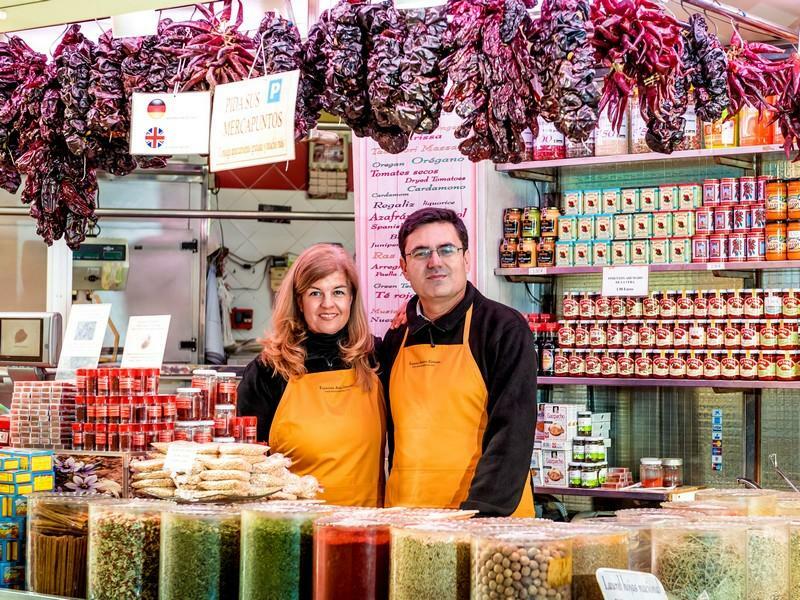 This website is the online store of the traditional spice trader Antonio Catalán, located in the prestigious Central Market of Valencia. Here you will find a wide assortment of spices: herbs for cooking and for medicinal use, sauces, teas and dried vegetables. In our online store we do not have a minimum order requirement, nor do we expect you to order large quantities - you can buy spices that weigh only one hundred grams if you wish. You decide what and how much you want to buy. Our specialty is paprika (both the kind from Murcia and the one from the Spanish region of La Vera) and top quality Spanish saffron. We have not only the most widely used spices in the kitchen such as cinnamon, pepper, cloves, curry etc., but also the less common ones such as cardamom or exotic mixtures such as Ras al Hanout or Garam Masala . We have an extensive catalogue of herbs for cooking such as oregano, basil, dill and tarragon. We would especially like to mention our preparations of aromatic herbs, which we have been doing for many years, and which are ideal for dressing salads, chicken or meat. We also have the most common medicinal herbs such as pennyroyal and camomile. We have several sauces and natural preserves such as Romesco, calçots sauce, flesh of ñora (ideal for any stir-fry) or choricero pepper meat, essential for success in preparing traditional dishes such as cod bacalao or Rioja-style potatoes. In the CATEGORIES section of this website you will find a more extensive list of everything we have, but feel free to contact us by e-mail or telephone, and we will be delighted to advise you on the ideal condiment for your dishes.